In November 2018, 23andMe became the first company authorized by the U.S. Food and Drug Administration (FDA) to offer direct-to-consumer pharmacogenomic reporting. Pharmacogenomic reports use genetic testing to predict how a patient may respond to certain medications. For example, if you carry a specific gene variation, then you might metabolize a medication faster or slower than most people. So what does this mean for you? While the FDA’s decision arms consumers and clinicians with more data that is relevant to personalized healthcare choices, it's important to understand the gaps between DTC and clinical testing. When the FDA was approving 23andMe’s test, they focused on ensuring that the laboratory results would report only on the variations that 23andMe could report on reliably and accurately. This is the basic level of analytical validity that CLIA (clinical) laboratories must prove to have their Laboratory Developed Tests (LDTs) approved. This is of course necessary, but not sufficient for a clinical test. To be worthwhile as a clinical test, it must have both analytical validity AND clinical utility. Since the technology that 23andMe is currently using cannot reliably test for all the variations that are clinically relevant, there are important gaps in coverage that a clinical lab will take the time and expense to resolve. A key example is testing for structural variations in the CYP2D6 gene. This is notoriously difficult, but critically important to ensure that a clinician does not falsely believe that a patient should receive a “normal” dose of some medications when their metabolism is faster than normal. One of the challenging issues with pharmacogenomics is that there are few doctors that know whether a medication is appropriate, or whether dosing should be modified, based on a genetic test result. And even if you know the how rapidly a medication is metabolized compared to “normal” it isn’t intuitively obvious how to adjust dosing because some drugs are cleared by metabolizing enzymes other prodrugs are transformed to their active form through metabolism. 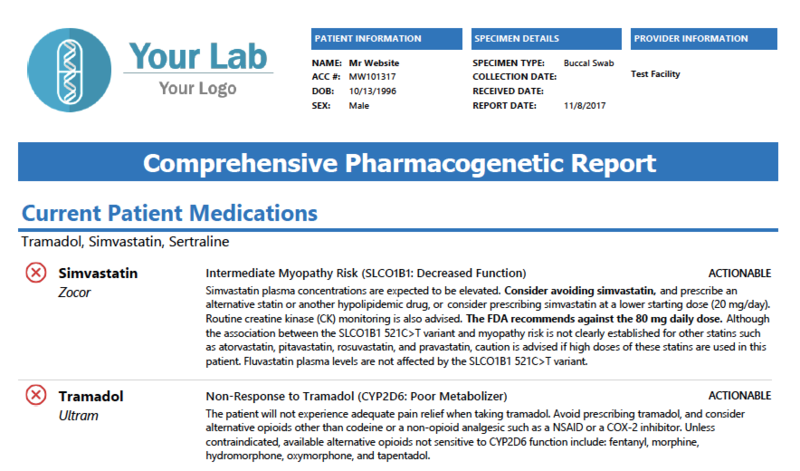 But out of concern that patients will modify their own medication regimens based on a DTC test, the 23andMe test will not include any information that would be relevant to a clinician’s decision making. Another special condition on the DTC test states that “This test does not provide information on associations between specific DNA variants and any specific therapeutic” so a doctor or patient that is presented with a DTC test report is faced with performing their own research. 23andMe claims that “user comprehension studies showing greater than 90 percent understanding of the concepts in our reports”. This is probably a pretty good metric for recreational genomics, but the clear implication is that if this test were available since the inception of 23andMe, over one million users would have misunderstood their PGx results so far. A large concern of the clinical community is being faced with trying to understand a test result that provides facts without information. The worry is that rather than advancing the cause of precision medicine, DTC tests will reinforce some physician’s belief that PGx tests are not useful because they are not actionable. This is why a clinical PGx test will include at least references to the relevant dosing guidelines and in most cases, they will provide the relevant practice guideline that matches the patient’s genetic profile. November 2018 marked a huge milestone for pharmacogenomic reporting when the FDA approved 23andMe for direct-to-consumer pharmacogenomic testing. The hope among proponents of precision medicine is that the visibility and marketing prowess of 23andMe will lead to increased adoption in the clinical setting. The concern is that the market power of the world’s largest DTC company will force out valid clinical testing and that consumers and their doctors will falsely assume that an FDA cleared test is good enough.